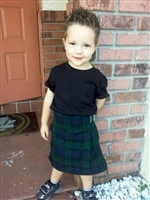 Our kid's kilts are great for the little Celts in your life. Our kid's kilts are 100% acrylic. They have two 2 inch of adjustment. They are fastened with two belts and buckles.